It's hard to remember a time when Norton wasn't suffering financial problems, but now the patient has taken a turn for the worse. Death appears nearly certain, and the financial vultures stand by, ready to pull the cash plug. 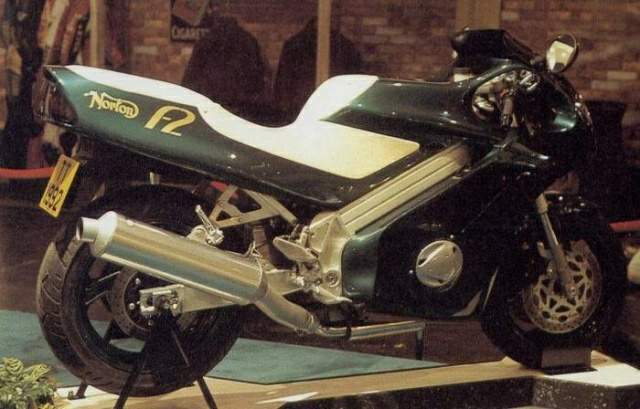 It's too bad, because one result of Norton's financial mess is that the F2 rotary-engined prototype shown in non-running form at last December's Birmingham Motor Cycle Show probably will never see production. Why build a prototype at all? Think of it as the product of hope, something to wave in front of potential investors: Look here, this is what we'll build if you give us the money. Unfortunately, the cards have been professionally stacked against Norton. The company finds itself way, way in over its head as a result of terminal greed on the part of its controllers during the make-a-buck Thatcher-Reagan '80s. Police and stock exchange authorities are presently investigating various conflicting interests. The short version of the story is: London financial district sharpies decided there was money to be made from Norton's well-established name. Having obtained control, they proceeded to rob, plunder, and diversify into furniture manufacturing, pipe-making, a German fastener company, gambling and night clubs, etc. The result was millions in debt for poor old Norton. Even in the best of times, a small-scale manufacturer of motorcycles would have difficulty servicing such a debt. Now times are hard. That's a shame, because the F2 appears to have real potential. 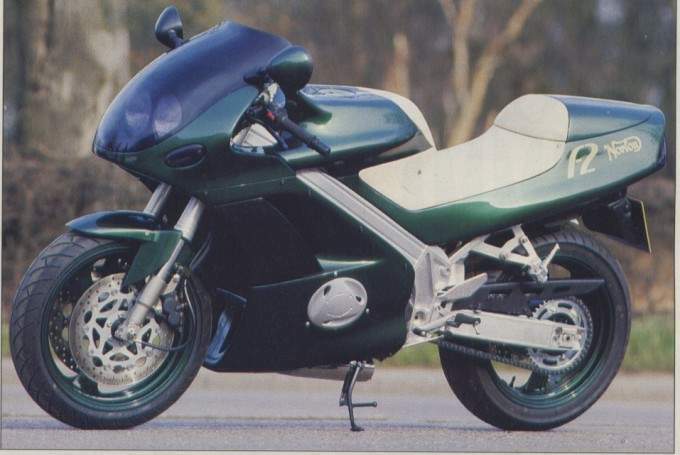 Designed by Britain's Styling International-whose clients include Nissan, Rolls-Royce and Mazda-the F2's shape includes elements of the Honda NR750 and Bimota Tesi ES, as well as smatterings of Aprilia. But the Norton's target price was to have been much lower than the price of any of those, the equivalent of about $13,500. Though no funds were available for actual wind-tunnel work, much attention appears to have been directed at clean aerodynamics. The tank shroud/seat unit is of carbon fiber, the rest of the bodywork is molded plastic. Head- and taillights shine through a specially treated dark perspex-a sort of one-way clear plastic. Chassis is by Spondon, and replicates the Harris build frame of Norton's 1991 Isle of Man-winning racer. For now, Yamaha FZR suspension components are in place, though the rear shock is mounted cantilever fashion, without benefit of rising-rate linkage. Brakes, wheels, five-speed gearbox, muffler and sundry bits are likewise Yamaha. Motive power is supplied by the same twin-rotor 588cc engine found in the F1, but rated at 95 horsepower at 9500 rpm instead of the F1s 90 at 9000. Internal airflow has been carefully designed to help disperse the rotary's considerable heat. A larger airbox plenum with large-diameter intakes for the car-type SU carburetors contributes to power, but was really designed to get the bike past stricter noise regulations to be implemented in 1995 in Europe. Norton claims this package will weigh in at 408 pounds-a full 110 pounds lighter than the Fl. Clearly there's a lot of wishful thinking wrapped up in the F2. The biggest wish involves actually building the F2. Norton's motorcycle production facilities are intact and, believe-it-or-don't, had proved themselves inherently solvent before the parent company's recent financial predicament. But now the factory is starving for cash to fund new products. Norton Group boss David Macdonald, who took control of the Norton Group at the behest of the group's creditors, has been working hard to divest the company back down to Norton Motors, and has had some success. Macdonald claims to have a $3.8 million investment package within reach, but nothing has yet been confirmed, and, indeed, it's hard to picture any sensible investor paying big money to buy Norton's even bigger debt. How about an insensible investor, then? The Italian Cagiva Group was interested five years ago, mainly to obtain use of the BSA name (which Norton Group also owns). Why? Because the Castiglioni brothers' dad used to ride a BSA and they thought it'd be neat to build new ones. But now, the Castiglionis say their portfolio contains all the motorcycle marques it needs, at least for the time being.